Welcome to the Death Valley National Park Information Page. Death Valley National Park is located in southeastern California and also parts of it are in southwestern Nevada. It is between the Amargosa Desert in Nevada and the Inyo National Forest in California. The park is transected from east to west by California Highway 190. On the east in Nevada, Highway 95 parallels the park from north to south with connecting highways at Scotty’s Junction (State Route 267), Beatty (State Route 374), and Lathrop Wells (State Route 373). The closest major airport is Las Vegas International Airport which is 120 miles Southeast of the park. 1. Take Highway 95 South to Stateroad 190 West the east entrance of the park. 2. Take Highway 395 South to Stateroad 190 East to the west entrance of the park. 3. Take I-15 South Las Vegas then take Highway 95 North to Stateroad 190 West to the park. 1. Take Highway 93 North to Las Vegas to Highway 95 North to Stateroad 190 West to the park. 2. Take Highway 95 North to Stateroad 190 West to the park. 3. Take I-15 North to Las Vegas to Highway 95 North to Stateroad 190 West to the park. 1. Take I-15 South to Las Vegas to Highway 95 North to Stateroad 190 West to the park. 2. Take I-40 West to Highway 93 North to Las Vegas to Highway 95 North to Stateroad 190 West to the park. 3. Take I-10 West to I-17 North to Highway 60 West to Highway 93 North to Las Vegas to Highway 95 North to Stateroad 190 West to the park. 1. Take I-5 South or Stateroad 99 South to Bakersfield to Stateroad 59 East to Stateroad 14/395 North to Stateroad 190 East to the park. 2. Take I-5 South to Stateroad 36 East to Highway 395 South to Stateroad 190 to the park. The park is transected from east to west by California Highway 190. On the east in Nevada, Highway 95 parallels the park from north to south with connecting highways at Scotty’s Junction (State Route 267), Beatty (State Route 374), and Lathrop Wells (State Route 373). South of the park, Interstate 15 passes through Baker, California on its way from Los Angeles to Las Vegas. State Route 127 travels north from Baker to Shoshone (State Route 178) and Death Valley Junction (Highway 190). West of the park, State Route 178 passes through Ridgecrest and Trona on its way north to a junction with 190. Also to the west, Highway 395 parallels the park from north to south with connections to Highway 190 at Olancha and Lone Pine. Death Valley’s outstanding natural beauty and scientific importance were first brought to the attention of the National Park Service in the late 20’s. With the support of Stephen T. Mather, Director of the National Park Service, Death Valley’s national significance was recognized, and it was proclaimed a national monument by President Hoover on February 11, 1933. With the passage of the Desert Protection Act of October 31, 1994, Death Valley grew by 1,200,000 acres and was designated a national park. 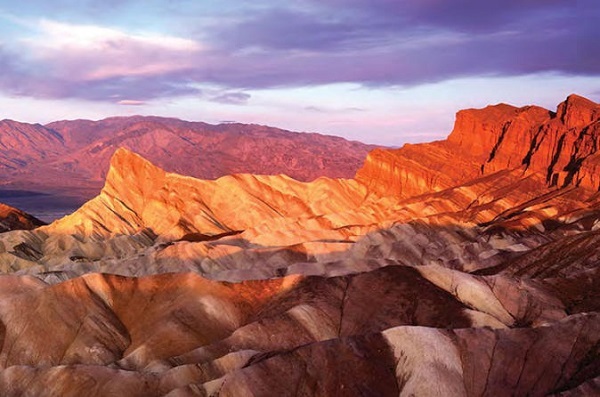 Today Death Valley National Park is made up of 3,336,000 acres and contains more than 3,000,000 acres of wilderness. Visitation is highest from February through mid April. The month of November is also busy. Visitation is lowest in December and January. Death Valley, the name is foreboding and gloomy. Yet here in this valley, much of it below sea level, or in its surrounding mountains you can find spectacular wildflower displays, snow covered peaks, beautiful sand dunes, abandoned mines and industrial structures, and the hottest place in North America. G.K. Gilbert, a geologist who worked in the area in the 1870’s, noted that the rock formations were “beautifully delineated on the slopes of the distant mountains, revealing at a glance relations that in a fertile country would appear only as the results of extended and laborious investigation.” The rock layers that Gilbert notices comprised a nearly complete record of the earth’s past, but that record has been jumbled out of sequence. The reason is that the rock layers that form the mountains are very ancient, but only in recent geologic time have they risen. Even as the mountains rose, erosion began to wear them down. An example of this is the formation of the alluvial fans. Intermittent streams, resulting mostly from the bursts of infrequent rains, rush down the steep canyons. It scours boulders, soil and other debris and pushes and carries the whole mass with it. It then deposits it on the valley floor at the canyon’s mouth. National parks are set aside for the enjoyment of all, however because of the rugged nature of many of the nation’s treasures, it is difficult to provide access for everyone who might have special needs. The National Park Service has been making strides to furnish facilities that allow everyone the opportunity to enjoy the beauties of the great outdoors. Furnace Creek, Sunset, Texas Spring, and Stovepipe Wells are wheelchair accessible. Death Valley has many unpaved roads. A vehicle with high-clearance will be necessary for all of the roads described below, but four-wheel-drive may also be required to travel over some of the rougher roads. More than 3 million acres of wilderness and over 350 miles of backcountry dirt roads are open. The basic road tour of scenic sights in the Furnace Creek area takes one full day. The tour of Scotty’s Castle requires a half day. Allow one full lifetime to explore all of this huge desert park! Bikes are only allowed on roads open to automobile traffic. Roads listed on old maps may no longer be in existence. Check at the Visitor Center for current road conditions. Bikes are not allowed to travel cross-country or on hiking trails. They are allowed on the hundreds of miles of dirt and paved roads. There are nine campgrounds open and many more possibilities for backcountry camping. The Furnace Creek Ranch and the Stovepipe Wells Village both provide small camper stores with all staple goods and supplies. There are many hiking trails of varying lengths and difficulties, but most backcountry areas are accessible only by crosscountry hiking. There are literally thousands of hiking possibilities. The Furnace Creek Inn and the Furnace Creek Ranch provide motel accommodations in the Furnace Creek area. The Stovepipe Wells Village provides motel accommodations and limited camping facilities. The Panamint Springs Resort offers resort accommodations and camping. A $10.00 Vehicle Entrance Fee is valid for seven days. For camping fees see the Camping Page. For Backcountry hiking and camping fill out a voluntary Backcountry Camping Permit. You can find these at the visitor centers and at a ranger station. Pets are permitted in developed areas and on park roads. They must be leashed and restrained at all times. Pets are not allowed off roads, on trails or in the wilderness areas of the park. One of the most beautiful times in the desert is when the sun is close to the horizon. The soft colors of sunrises and sunsets can show you many of the different moods of Death Valley. Located in the center of the park, the Furnace Creek Visitor Center houses museum exhibits, a visitor information desk, and the Death Valley Natural History Association book store. The Furnace Creek Visitor Center is open daily in summer from 8:00 am to 7:00 pm, and is open daily in winter from 8:00 am to 6:00 pm. There is a contact and fee collection station at Stovepipe Wells Village with a Natural History Association book sales outlet. The tour ticket office at Scotty’s Castle also has a book sales outlet and a small museum with displays from the Castle collection. Reservations for special tours or guides for groups are available if staff is available. Make requests as far in advance as possible by telephone or in writing. Organized tour groups may make reservations for Scotty’s Castle tours. Death Valley is generally sunny, dry, and clear throughout the year. The winters are mild with occasional winter storms, but summers are extremely hot and dry. Summer temperatures commonly run above 120 degrees fahrenheit. Comfortable sports wear providing sun protection and sturdy walking shoes are recommended in summer. Winter requires warmer clothing and light to medium jackets.